The Scottish-English border is a region in itself. It is neither England nor Scotland, but a culture of its own (ask any Borderer). 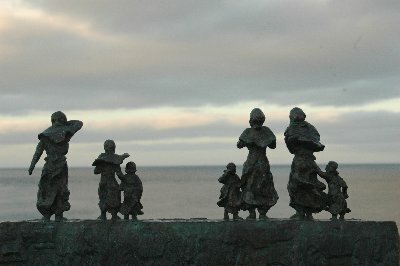 The modern borderline is arbitrary, having moved north and south many times in the last 800 years and included "disputed lands" at many periods of history. Our Borders Tour encompases the Scottish and English "East Marches" beginning in the Lammermuir Hills just south of Edinburgh, through the Cheviot Hills to Hadrian's Wall in Northumberland (where the Romans sited the border 1900 years ago). 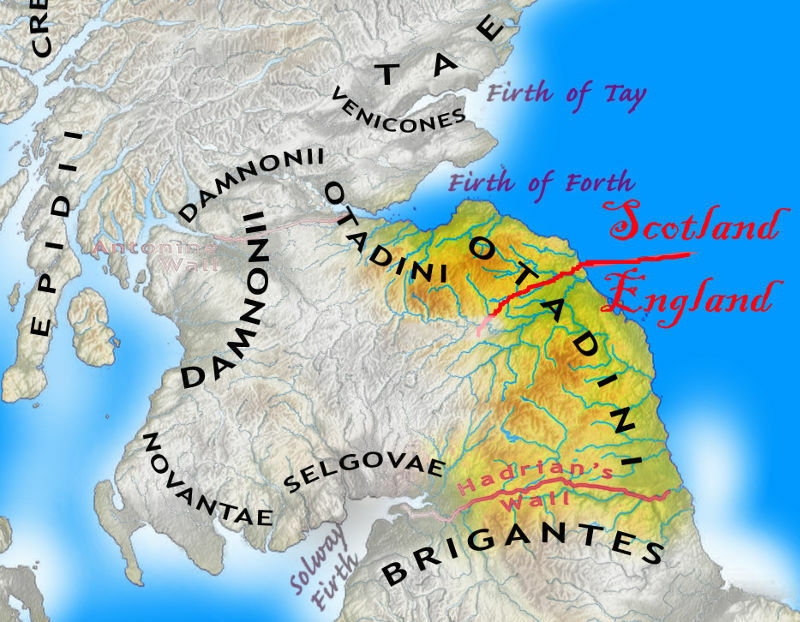 The Roman map to the left shows the area covered - the land of the Otadini Celtic tribe. There is a huge density of interest in this small region, from history to scenery, to literature, to ancient sites, to castles... yet it is undervisited by tourists, or to be more accurate, it is visited by a small number of British travelers, and they're keeping it to themselves! The tag line for this tour could be "great places that you've never heard of." 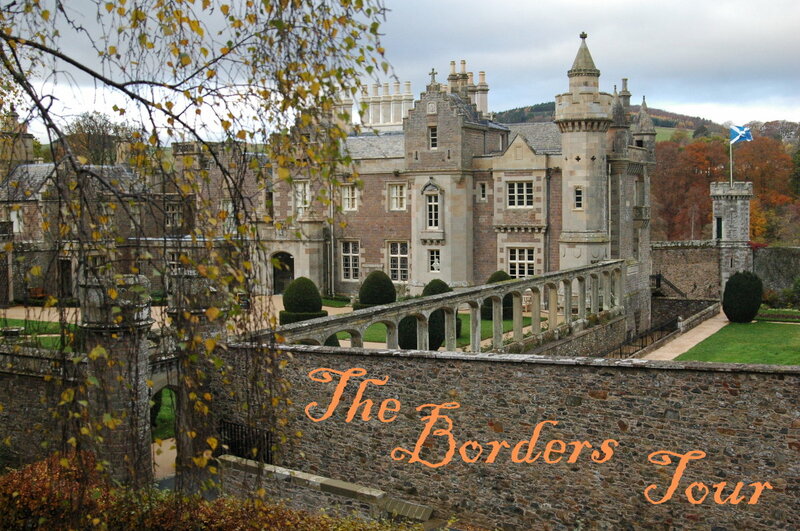 Another reason to tour the Borders with us is that we're telling you it's worth it! Almost all our guests thus far have been prior guests on our other tours. They know our style and trust us to pick great things to do and if we say that this region is our favourite, they know they'll enjoy it too. 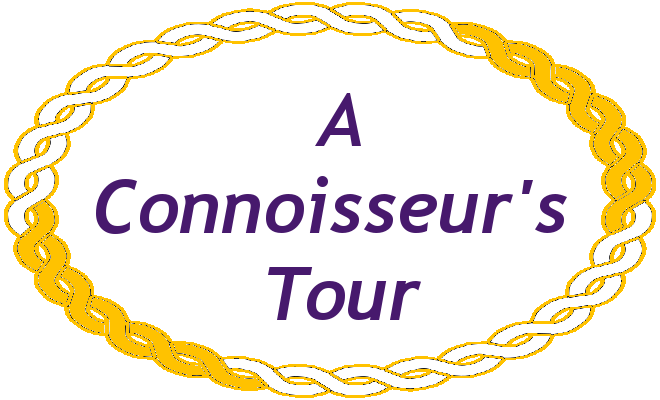 This is why we call this "a connoisseur's tour". One for the second-time-around visitor or those seeking the road less traveled. 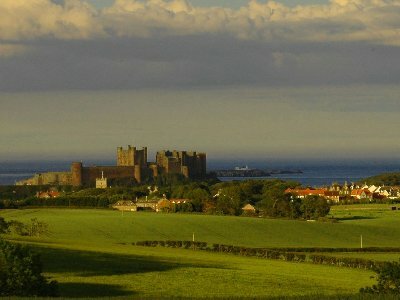 Think: rolling green hills and wide North Sea vistas; Think oddities, quirks, things to furrow your brow; Think a century behind the present; Think border ballads, folklore and literature; Think hunting dogs and medieval castles; Think understated, peaceful, remote. It's enough to lose your head and your heart to... Just get excited quietly aye? There are some videos at the page foot to give you a flavour of the tour. How do we explore this region? We don't cover many miles in the vehicle in the week. We walk the towns, the cliff tops, the ruined abbeys, the riverbanks and remote Cheviot valleys. 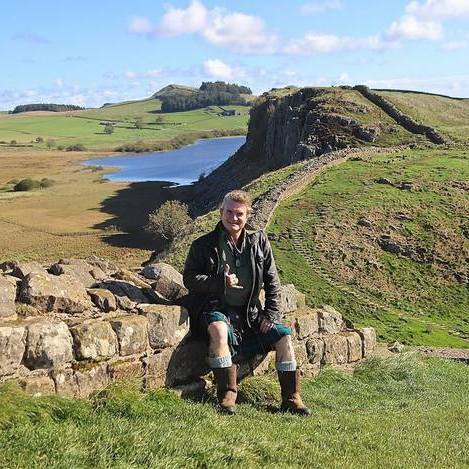 We hike a few miles of Hadrian's Wall (see Activity note). There is a strong literary theme to this tour, picking up on local authors, visiting the "Harry Potter Castle" as used in the film adaptation, sharing readings from local books. We stay with and meet Borderers. We often stay in a 700 year old castle too. Every time we host the tour it changes: there is no "Best of the Borders" as there is far too much to to fill a week and we, your guides, are exploring the region for ourselves on each tour. View the TnC page for deposit payments etc. 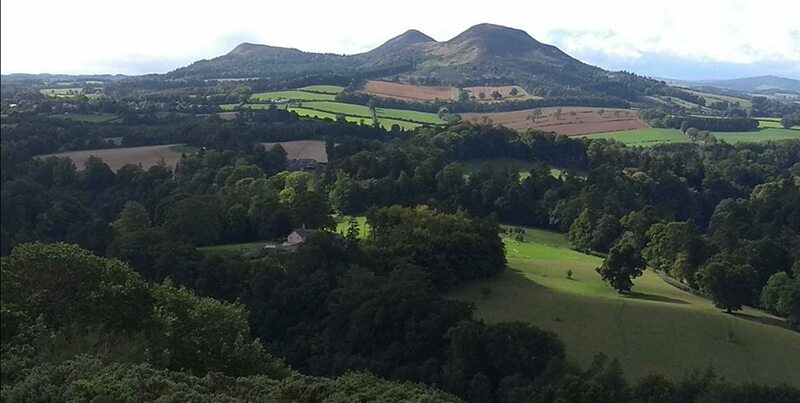 We head south from Edinburgh and the land begins to roll in green hills and deeply wooded cuts of rivers. 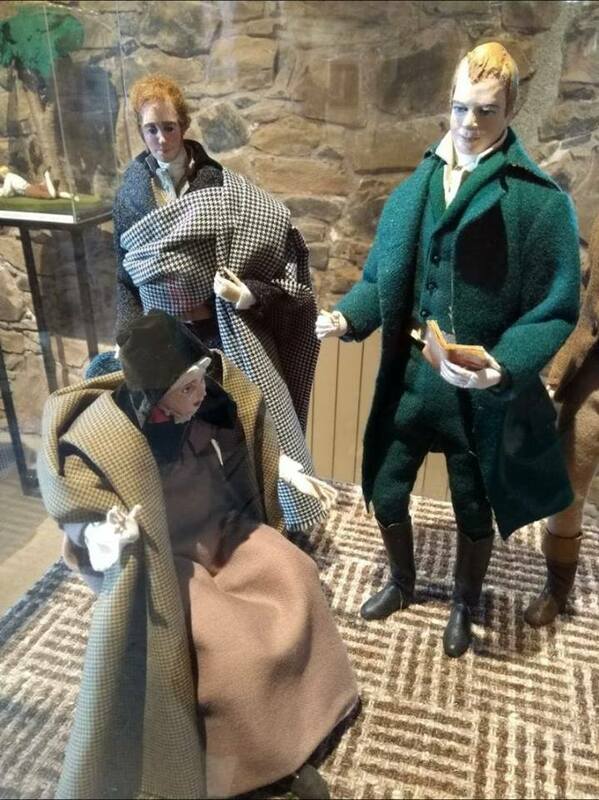 We'll visit the opulent home of the 19th century's most acclaimed Scottish author, Sir Walter Scott, the writer responsible for inspiring Queen Victoria to travel to Scotland. 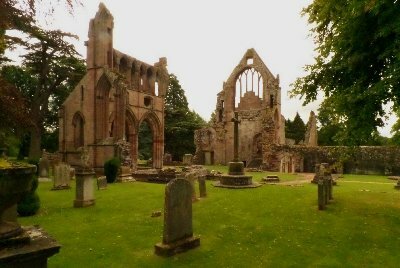 Our first walk of the trip will be gentle as we make our way to the River Tweed connected to the romantic ruin of Dryburgh Abbey where we'll continue our walk to explore its grounds beautifully tucked into the wooded glen. Our accommodation will be in a B&B chosen for local hospitality. Alnwick Castle, so much more than Harry Potter! 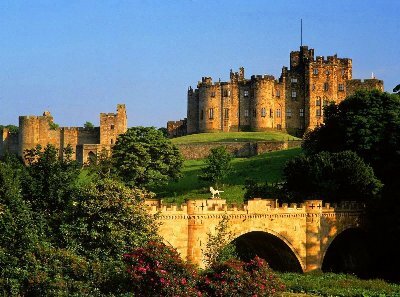 We'll spend a couple of days based near the centre of Alnwick, and visit its castle, famous for Harry Hotspur long before Harry Potter flew his broomstick there. 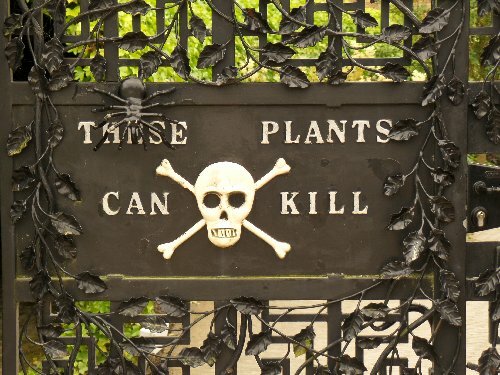 We'll explore the beautiful castle gardens and be guided through the poison garden, a worthwhile, intriguing and sometimes humourous visit. Alnwick also boasts Barter Books, the book emporium that rediscovered "Keep Calm and Carry On". We'll make a special visit to this book seller to each buy a copy of any book that takes our fancy for quoting along the way. We did mention the literary theme, aye? There's enough around Alnwick to keep us going for a couple of days. Prepare for the best seafood you may ever have eaten! Check out the video above for that. We'll also put in a few secret visits during this time. Shhh, don't tell anyone. Journeying further south into England we'll visit Hadrian's Wall, built almost two thousand years ago and still in use. A hike along the Roman ruins will leave you feeling strangely displaced amidst the rolling hills of an English moor. While in the area, we'll dip back into literature with a visit to the scene of Diana Gabaldon's Outlander opus. 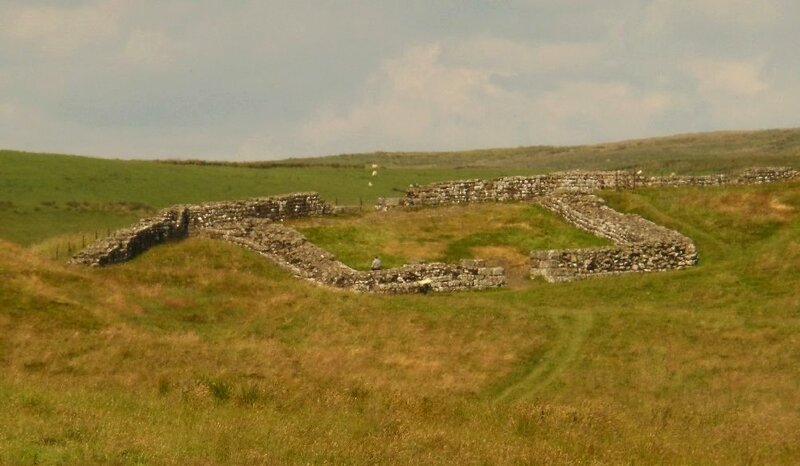 We'll visit the site of Jerry MacKenzie's downed Spirtfire at a Milecastle. The last two days will be distinctly coastal with a visit to two castles that sit dramatically above the ocean on the North Sea and face Norway - one is grand, martial, large; the other is the cutest, cosiest castle you'll ever visit. 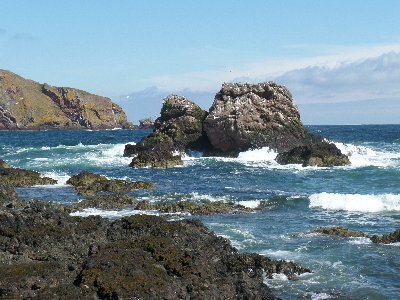 We'll explore a hidden cove tucked into sea cliffs and take a cliff-top walk overlooking the waves below and we'll see and hear sea bird colonies while the coastal view offers stretches of old fishing villages of the Scottish and English fleets. Reluctantly we'll head back to the bustle of Edinburgh by around 5pm on the last day. Note: We may rearrange the order of the itinerary out of necessity or to take advantage of the special events yet to be announced. 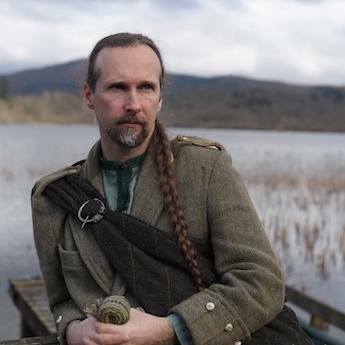 Scot AnSgeulaiche, myself, bringing Celtic and Roman history. Samantha MacKenzie, bringing her eye for the quirkiness of the Borders (and your only guide wearing trousers). Hamish Douglas Burgess. We are very much hoping to have a return of Hamish on this tour (he was such a hit with the guests last year), bringing art and music. We stay in three places across the eight days / seven nights of the tour. The first two are 4* B&B, the last two nights are a castle. We can recommend a hotel for the night before and after the tour, close to the meet point / drop point. Note that due to the nature of the accommodations, twin beds (two single beds in a room) are not possible in every accommodation and friends traveling together will a share double bed in at least one of the three lodgings. View the TnC page (new window) for deposit payments etc. The itinerary and accommodation changes each year, but these short films will give a good idea of the typical "Borders Raid"
A short clip of Roman ruins from 2017, including guest comments. Follow Scottish.Highland.Traditions page on Facebook to get the announcements. As with all our tours, they are active. 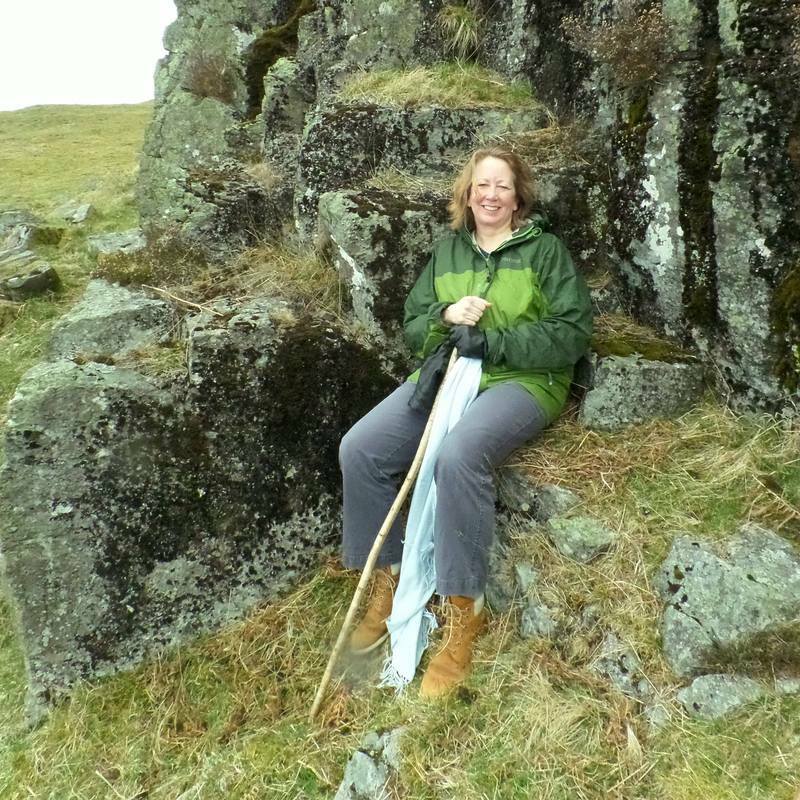 We spend most of the day on our feet (rather than in a vehicle) with the activity level ranging from strolling through towns to hiking at a good pace along Hadrian's Wall. Guests are expected to carry their own luggage between vehicle and accommodation. In some remote places, the next toilet break might be two hours away, with only Nature's Bathroom as your fallback. When you apply for a place on the tour, you will be asked for some health and medical details. This is used by the guides to assess whether you will be comfortable on the tour. A good yardstick is the time of your one minute mile walk on the flat: test yourself. If you can walk a mile in 17-20 minutes, you will find the tour about right.